Discussing celebrities is one of the most popular favorite discussion topic. We love to hear about them and keep ourselves updated about them through magazines, newspaper etc.A celebrity doesn’t necessarily refer to people from the Bollywood or Hollywood film industry. We can say, a celebrity is a person who is an idol, role model or a motivating personality from the field of sports, politics and social works. The word ‘Celebrity’ is assigned to a person who is famous among the people due to some of his/her characteristics, work, contributions and proving himself or herself in a specific field at par. 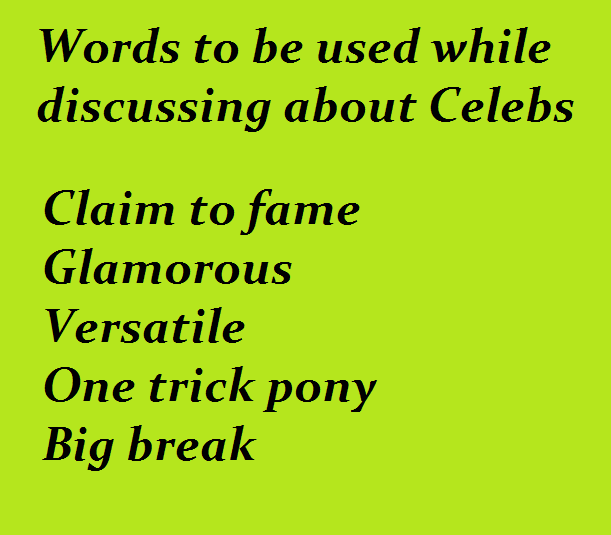 In this blog, we are going to see a set of vocabulary which could be used while discussing about celebrities. Let’s see what these words are. This word refers to Bollywood and Hollywood personalities who are beautiful or handsome, can present themselves best and maintain their popularity by involving dedication in their field of acting. These people have the best ability to showcase the fashion to the entire world. Example: Aishwarya Rai is considered as a glamorous actress. When a famous personality is recognized by the mass for excellence in his work or contribution in any field. Example: Even with all his wealth and fame, he's unhappy. It is a famous phrase used to state an impression and quality work feature of a perfect person who has just been born to be excellent and prove himself/herself in his/her respective field(s). Example: Sachin Tendulkar is the only claim to fame for the 20’s generation. This word is used to describe a personality who is able to adapt or be adapted to many different functions, roles or activities. Example: Mr. Shahrukh Khan is a versatile actor. This word is used for the celebrity person who has got a good opportunity and fortune to showcase his talent and achieve a great success in his field of work. Example: Dhoni got a big break in the field of cricket. A personality who is skilled only in a field or a specific area of work and he/she performs and carry themselves at par, are termed as ‘One Trick Pony’. Example: A comedy king in Bollywood Mr. Johny Lever is a one trick pony. It means to have problems because of your success. Example: Politeness, consistency of success and patience will never make any personality from becoming the victim of their own success. The above vocabulary will help you in describing your favorite discussion topic. Next time when you talk about celebrity, you have an opportunity to showcase your knowledge and skills by using such vocabularies. You can also improve English communication skills with an online Spoken English course. 2. How to describe people in English? 3. How to Introduce your Spouse to Your Parents? 4. Why parents should encourage their children to speak English?